No, I have not been converted. Although I have been living in Co Limerick for almost 10 months, I am still a Leinster fan. My roots in Wexford and Dublin and many years of fun and pleasure are not going to change my loyalties. Although my mother’s family is from North Cork, I am still a Leinster fan. But one recent morning in Limerick, I decided to walk out to Thomond Park, the home of Munster. The stadium is owned by the Irish Rugby Football Union, but is really the home of Munster Rugby, and home too to Shannon RFC and UL Bohemian RFC. Thomond Park is the result of a large-scale redevelopment in 2008 and today has a capacity of the stadium is 25,630. 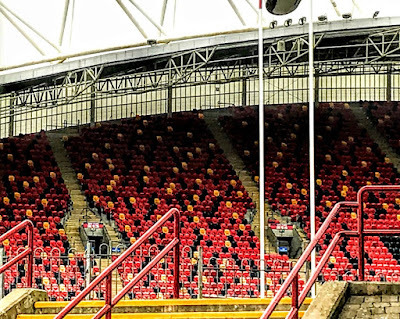 With its unique history and atmosphere, Thomond Park has a special place in rugby. 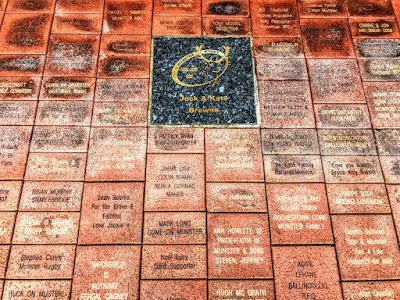 Thomond Park has hosted five Ireland internationals, with the first played in 1899 against Wales. This is where Munster beat the All Blacks 12-0 in 1978, and this where Munster had a 12-year unbeaten run in the Heineken Cup, from 1995 until 2007, when Munster lost 13-6 to the Leicester Tigers. Originally there were two pitches at Thomond Park, the main pitch and a training pitch, and two pavilions, belonging to Shannon pavilion and the Bohemian. In the past, the terraces had their own names, including the ‘Popular side,’ the ‘Stand side,’ the ‘City End’ and the ‘Ballynanty End.’ Those terraces have been transformed, but the traditional songs and anthems of the home fans still include The Fields Of Athenry and Stand Up And Fight. The home crowd is also famous for its silence when a player is kicking for goal. Work on redeveloping Thomond Park began ten years ago in early 2007, and the project was completed for a re-opening in Autumn 2008. Maintaining the atmosphere and close relationship between players and spectators was key requirement of the brief. Two new stands were built at the main pitch, with a seating capacity of 15,100 and terrace capacity of 10,530. The key design aspirations, in addition to fulfilling the requirements of the brief, were as follows. ● To ensure a positive impact on the cityscape and skyline, given its elevated site in relation to the surrounding city. ● To integrate the building with its immediate context. The existing buildings in the area are predominantly two-storey houses to the north and south of the stadium, so it was a challenge to incorporate a large structure into these surroundings. The three-dimensional form of the stands is a direct product of achieving optimum viewing for all spectators. The optimum functional layout of a rugby or soccer stadium is generated by accommodating all spectators within 90 metres of the centre of the pitch and within 150 metres of all four corners of the playing surface. This generates an ‘orange segment’ profile, where the maximum number of spectators is concentrated on the centreline. The fact that Thomond Park is not enclosed on all four sides is important so that views into and out of the stadium are maintained. A ‘bowl’ type stadium would eliminate the visual and acoustic connection with the city. Instead, the barking dogs of Ballynanty and the hum of traffic on Cratloe Road add to the atmosphere when silence descends on the stadium before that goal kick. 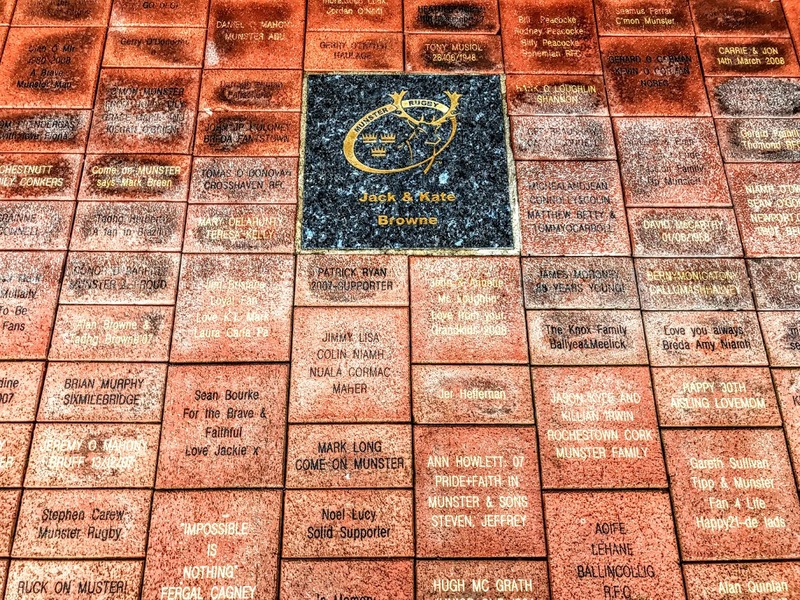 These important aspects are part of the distinctive character of Thomond Park. It is no wonder, then, that the home of Munster rugby secured another victory in 2009 when Thomond Park was crowned the people’s choice at the Irish Architecture Awards. The €40 million redeveloped stadium pulled in more than one-third of the 5,000 online votes in the public award. Hugh Murray, of Murray O’Laoire Architects, said he was proud of the stadium as an architect, a Limerick man and a Munster supporter. ‘Maintaining the atmosphere and close relationship between players and spectators was a key requirement of the brief,’ he said. Since then, Thomond Park has also been the venue for concerts by many artists, including Elton John (2009), Rod Stewart (2009), Bob Dylan (2010), the Cranberries (2010), and Bruce Springsteen (2013). In August 2013, Thomond Park was named the ‘Best Rugby Stadium in the World' in a vote by Rugby supporters around the world. When Thomond Park was being redeveloped, rugby fans feared it would be renamed in a sponsorship deal. Thankfully, the name of Thomond Park has been retained with naming rights instead being sold for the individual stands. If only the same had happened at Lansdowne Road.